It is time to say goodbye to the summer months and put away our sandals as Autumn has already shown its face! Yesterday was so so cold and I loved it and hated it at the same time. I love wearing big jumpers but Autumn mornings are one things I hate, I'm so cold when I wake up! Either way though one thing I do know is that a new season means new clothes and boy do I love buying new clothes! 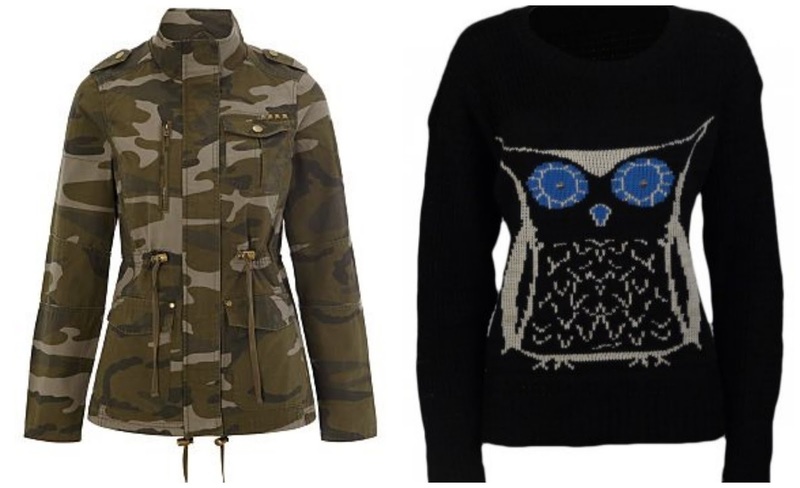 I thought I'd show you a few things I have my eye on, mainly boots and jumpers at the moment! 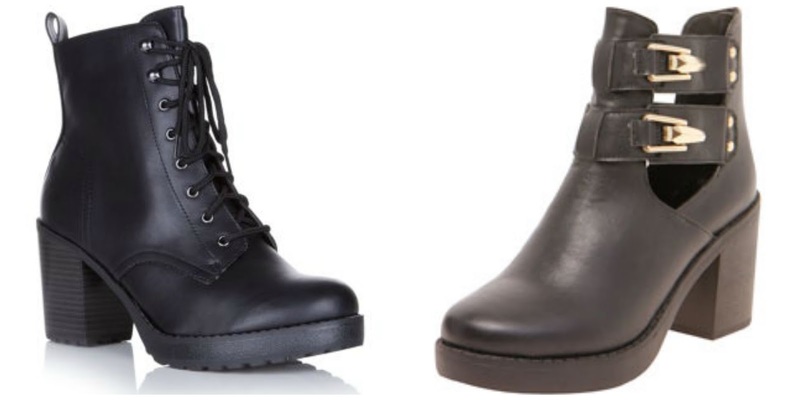 I've been going crazy over boots recently and really want to pick myself up some! 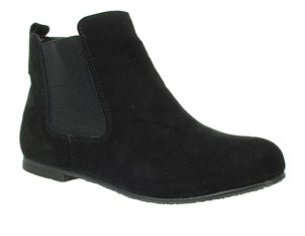 My problem is that most flat boots don't suit me yet boots with a little heel do, so weird! I've found 2 pairs that I am totally in love, I might treat myself to one of them in the upcoming weeks! The first pair are these gorgeous black military/biker style boots from New Look. I can't remember if I've talked about these on my blog before but if I have, oh well, I really love them! I've tried these on in-store and they are so comfy and really flattering on me. They are £30 which is a lot for me to spend on a pair of shoes but I really want them! The next pair are from Boohoo and from what I've seen they seem to be very in at the moment! I don't know how flattering the cut out would be on me but with the weather going down hill quickly I'd probably pair them with some frilly socks! They are the same price as the New Look ones so I imagine it is going to take me quite a while to decide which pair to buy if I feel like treating myself! I also came across these flat ankle boots from Barratts, I did just say flat boots don't typically suit me but I love these! They are really simple and I imagine they would go with quite a few outfits! They would be perfect for Sixth Form as well! I never used to be a shoe person but recently I've just seen so many pairs that I want! 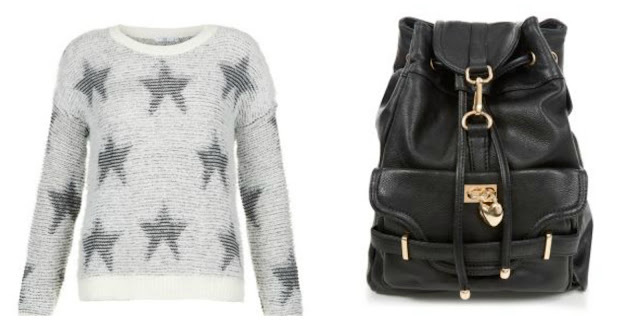 Whilst on the New Look website I also spotted a few others items including this star jumper! I'm always looking to buy more jumpers as you can never have enough. This one looks so fluffy and would make a change from all the dark coloured jumpers I tend to wear! I think it would be perfect oversized as well with some skinny jeans and boots. It's £25 which is a little pricey in my eyes as I'm a Primark girl mainly but I really love it! Recently I've been looking for a new bag and with my operation hopefully coming up soon I figured my best option when it comes to bags is to get a backpack. Lucky for me they seem to be quite fashionable so there are some really nice ones around! I love this New Look bag, it is black and simple but I love the gold details on it! It's the time of the year where everyone is looking to buy a new coat and I'm no exception! I've been looking at Camo style jackets recently and after searching for an affordable one online I came across this one from George at Asda, it's only £13 in the sale! All sizes are currently sold out but I'm hoping some sizes come in stock or I'll be looking for another one! Here's another adorable jumper, this time from Karma Clothing. I love owls and have quite a few owl ornaments around my bedroom but strangely don't own any clothes with owls on! When I saw this though I fell in love with it and I really need it in my life! It's so cute and I love the pop on colour on it, this is on sale as well with £3 off! Those are the fashion pieces I'm after for this A/W, I'd love to know what you have your eye on! Love the biker boots you picked out! I really want some too, and the army print jacket is really nice, i want one too! Oh I love the New Look boots they're gorgeous!